Type C Replacement Filter Elements - Airsan Corp.
Airsan Type C filters are designed for engines, air compressors, blowers and large-scale industrial generators. The oil-wetted, multi-crimp replacement elements are optimized for maximum airflow and to maintain a minimal pressure drop. Filter elements are also available without oil wetting, offering an effective option for oil-mist control or moisture elimination. 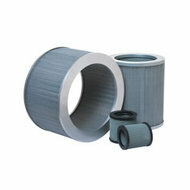 AIRSAN TYPE C FILTERS ARE DESIGNED FOR ENGINES, AIR COMPRESSORS, BLOWERS AND LARGE-SCALE INDUSTRIAL GENERATORS. THE OIL-WETTED, MULTI-CRIMP ELEMENTS ARE OPTIMIZED FOR MAXIMUM AIRFLOW AND TO MAINTAIN A MINIMAL PRESSURE DROP. TYPE C ELEMENTS ARE ALSO AVAILABLE WITHOUT OIL WETTING, OFFERING AN EFFECTIVE OPTION FOR OIL-MIST CONTROL OR MOISTURE ELIMINATION.